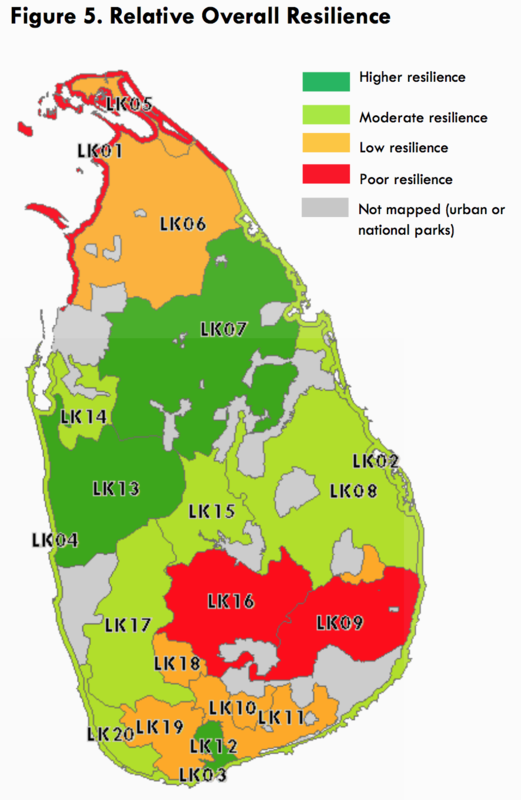 Map of relative overall resilience in the different livelihood zones of Sri Lanka (from the 'Overall Resilience' section of the report). Red - chronically food insecure to green - food secure. Sri Lanka is exposed to a diversity of climate-related hazards, including floods, droughts, landslides and storms. Extreme climate events can have detrimental effects on livelihoods, for example, through destruction of livelihood assets (farming tools, fishing boats, water tanks for irrigation) and destruction of agricultural land which may take several months or years to recover. Historical trends suggest that the number of people being affected by climate-related hazards is increasing, from an average of approximately 400,000 people affected every year between 1980 and 1990 to an average of 750,000 affected annually between 2000 and 2013. The majority of the affected population is exposed to drought or flood—both of which are linked to failure or high intensity of the monsoon rains. The increase in exposure is largely due to erratic monsoon patterns. In addition to increasing magnitude, recent evidence suggests that both hazards are occurring in areas where they typically had not previously. This report* presents the results of a Consolidated Livelihood Exercise for Analysing Resilience (CLEAR), which mapped community livelihoods and resiliences across the country. It aims to inform climate change adaptation policies and programmes related to food security and livelihoods in the country, and is intended to be used as a tool to identify adaptation options for the most vulnerable livelihoods. *Download the full report from the right-hand column. 21 different geographic livelihood zones (Figure 1). Rural livelihoods in Sri Lanka are broadly influenced by agro-climatic and topographic features. E.g.,households in the ‘Dry Zone’ of the country are traditionally engaged in paddy farming, made possible by the extensive irrigation network of over 11,000 water tanks. Livelihoods in the intermediate climatic zones are largely differentiated according to topography. E.g., in flatter regions, households typically rely on coconut plantations (especially in the so-called ‘Coconut Triangle’ and a small coconut area in the southern part of the country in the southern parts of the country). Livelihood Zones of Sri Lanka (Figure 1 from the report). Road access and thereby access to larger and more diverse daily markets is poor in these zones, contributing further to the status of chronic food insecurity for the poorest households that tend to be the most isolated. and Northern shore fishing (LK01). Households in the coconut and agriculture triangle (LK13) and southern coconut and mixed agriculture (LK12) are considered to be amongst the most food secure zones based on year-round profitability of coconuts and relatively stable production of food on homestead plots. Map of relative food insecurity in Sri Lanka (Figure 2 from the report). Changes in climatic patterns, both long-term and seasonal, have a detrimental effect on livelihoods that depend on climate-sensitive income, such as seasonal or daily agricultural labour, sale of rainfed crops, and fishing. Incomes for the poorest households are particularly climate-sensitive in most of the Dry Zone, as well as in the coast. Fishermen in the northern coast of Sri Lanka are highly vulnerable to climate risk—during the northeastern monsoon, fishing is not always possible and therefore households have to engage in unskilled labour. The availability of labour in this period is not always predictable. Paddy in the southeastern region of the country is usually cultivated in small holdings, and the poorest households depend almost exclusively on rainfall. Annual rainfall is decreasing rapidly and northeastern monsoon rains are becoming increasingly unpredictable. There has been a noticeable decreasing trend in rainfall across most of the island—except in the northeast. Mean annual rainfall has decreased by 144 mm (accounting for 7% of the annual total) compared to the period 1931-1960. The northwest monsoon rains have decreased and have become increasingly erratic. Historical trends suggest that the number of people being affected by climate-related hazards is increasing, from an average of approximately 400,000 people affected every year between 1980 and 1990 to an average of 750,000 affected annually between 2000 and 2013. First, sea levels will rise, affecting all coastal areas of Sri Lanka. Second, rainfall is already highly erratic and likely to become more so in the future, particularly during the northeastern monsoon. Livelihood zones are highly diverse, and households within a zone may engage in a variety of activities depending on their access to resources. Understanding the different livelihood characteristics provides useful information to better identify food security and resilience patterns and inform programmes to support the most vulnerable populations. Climate variability and change disproportionately affect the poorest and most food insecure through a combination of decreasing crop production, decreasing resource availability, higher magnitude of disasters, and unpredictable weather. Livelihoods in Sri Lanka have geographically distinct patterns of resilience. The most resilient livelihood groups are those in the Mahaweli mixed farming & livestock, and in the coconut and agriculture triangle. This is largely due to a combination of access to a diversity of income and food sources, relatively good access to major cities and economic centres, and access to micro-tanks to better manage the impact of drought. However, multi-year droughts or particularly severe droughts may challenge this resilience in the future, as seen in the recent erratic weather patterns of 2013/14. Generally, there is poorer resilience in the north, and in the southeastern parts of the country. Resilience capacity in the Jaffna mixed agriculture and northern mixed agriculture and palmyra plantation zones is likely to improve rapidly over the next years following the end of a protracted crisis which affected millions of livelihoods - especially as critical infrastructure is enhanced and developed. The poorest households in the tea estates have poor resilience due to chronic poverty and very low diversity of livelihoods. Although their primary livelihood activity – namely tea plucking – is not particularly climate sensitive, the high reliance on this activity means that households are susceptible to income variability based on demand for tea elsewhere. WFP (2017). Sri Lanka: Consolidated Livelihood Exercise for Analysing Resilience.